Dancing with poi is enchanting when seen performed. Dancers may twirl one or more poi simultaneously, and sophisticated performers will achive great dexterity and co-ordination with the music. Poi are, well, basically balls on cords! Original Māori poi were made from flax blades, raupo, corn husks and core pith. Māori men used rocks, helping to build those muscles! 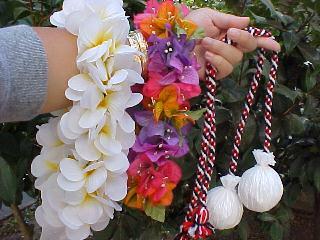 Modern Māori poi consist of paper, foam, plastic, wool and strings. Materials used for these are aluminum, wood, stainless steel, brass, nylon, ripstop nylon, hi-impact plastics, kevlar, cotton, fluorescent chemicals and electronic circuitry. Originally, it didn't matter. It could be ball or egg shaped. Cord length came as 82cm (long poi), 30cm (three-quarter), 25cm (short poi). Even now the shape does not matter. You can even have double headed poi if you wish. A lighter poi suits a short cord and heavier poi suit a longer cord. This weight is necessary to overcome gravity on the upward swing. A light poi on a long cord may not swing properly at the top of its flight. Also if you are performing outside a light poi will we blown about and made very hard to control. A very heavy poi may be good in the wind, but it could damage and strain your muscles, or even worse break the cord/chain and fly off and hit your audience! Poi has also developed into Fire Poi, Tailed/Ribbon Poi and Lighted Poi.